The family name of Queen Elizabeth one was Tudor. They were definitely a notorious lot. Not the least being her own parents, Henry VIII and Anne Boleyn. Her grandfather was Henry Tudor, who went on to become Henry VII after performing marriage with Elizabeth of York. Her father’s first wife, Katharine of Aragon, gave birth to a girl, Mary who was later known as Mary Queen of Scots. Mary, hence, was her half sister. King Henry married Anne Boleyn after a long wait and the beginning of England’s strife with the church. Anne Boleyn, Queen Elizabeth’s mother was executed when she was barely six years old. Her father then married Lady Jane Seymour who gave him his first and only son, Edward. After the death of Lady Jane Seymour at childbirth, Henry VIII married Anne of Cleves who became Queen Elizabeth’s step mother. After annulling his marriage to her, the king married yet again, a certain Catherine Howard, who was executed. At long last, he finally married Katherine Parr. It would seem that Elizabeth was raised by a string of nurses, governesses and step mothers. The family of Queen Elizabeth was not family in a real sense, it was fraught with court politics, intrigue and treachery. After the short reigns of Edward VI and Mary Queen of Scots, Queen Elizabeth ascended the throne. Her family, with the possible exception of her mother and Jane Seymour did not want her to stand in line for accession. Queen Elizabeth I was a protestant by religion. She was raised one. She reversed the strict catholic regime of Queen Mary and at the same time chose not to condemn those who followed that school of thought. She was neither a puritan nor a catholic. Queen Elizabeth sought to open the church’s doors to whoever professed Christianity, regardless of its bifurcations. She was known to be extremely tolerable, far more than her peers were. She was a radical of her times. Although, she did not openly rebuff Catholicism, she also abhorred certain practices by the Protestant church and was not overtly religious. Above all, she desired her country to be free of strife and internal problems. 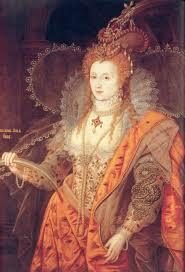 Queen Elizabeth I never married and hence, she never had any kids of her own. Whether or not she wanted children remains to be speculated. Nevertheless, she enjoyed the attentions of certain men whom she allowed to court her, even though none of the relationships culminated in a marriage.